As expected, Subaru had a bunch of cameras rolling when they gunned for a Nürburgring lap record attempt. The car they used was a specially honed (deep breath) WRX STI Type RA NBR Special, and it proved to be good for a 6:58.9 lap around the Nordschleife, in the hands of Richie Stanaway. Now, video material of the sedan car record run has been posted on Subaru's social media pages, and it includes a separate "Behind the Scenes" video. 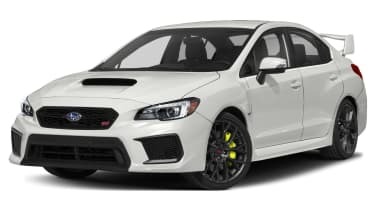 The record car was built by Prodrive, and it consists of a 2017 WRX STI with a full roll cage, fitted with a WRC specification two-liter turbo engine that produces more than 600 horsepower thanks to its 75mm intake and 25 psi of boost. The transmission is also a WRC item, and its hydraulic paddle-shift setup together with an automated clutch enables shift times of 20-25 milliseconds. The track time is quicker than a recent privateer attempt using a 2017 Dodge Viper ACR, which squeezed the time down to 7:01,3 until a tire failure caused it to crash. Of course, the Viper was classified as a production vehicle, unlike the Subaru.